At Central College in Pella, IA I was waiting on the noon class change and heard carillon music bouncing off of the campus buildings, later finding out that it came from the Klokkenspel in downtown. Originally a Dutch settlement, still embracing their roots, I learned about Pella Baloney and dried beef at the 140 year old Ulrich’s Meat Market. Oh and there are three windmills in downtown (More about windmills in my next post). Details like these help me understand what makes every college and university so special. Next time I hope to see more of Lake Red Rock and make a visit to the Neal Smith National Wildlife Refuge. Author’s Note: It seems that Part 2 came before part one. 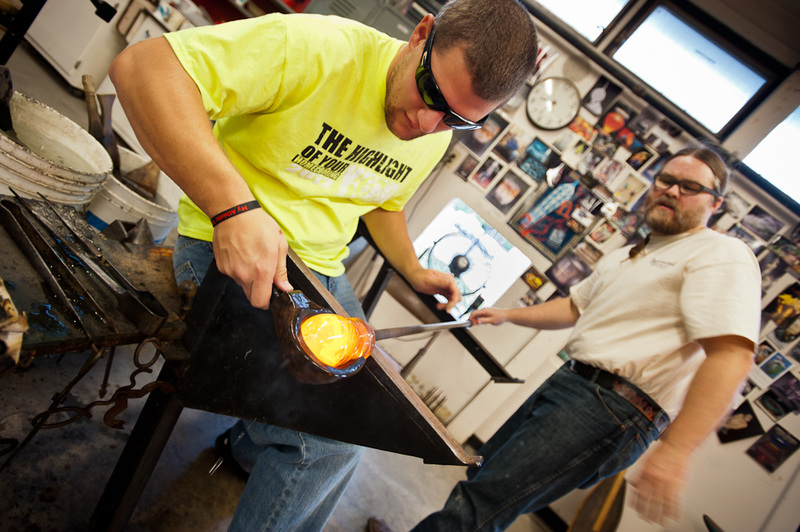 But add to this that the glass-making at Central College is the first time I have documented that artform in all of my travels and it was well worth the wait.